It is time for the ALWAYS fun Sew Mama Sew Giveaway Day! I actually have THREE Prizes that I am giving away today, so check them out and get your entry in! If you are new to my blog, welcome! It's great to have you here! I do hope you will take a moment to look around and check the place out! If you like what you see, feel free to follow and/or like my Facebook page! Both options are available on the right hand side bar. Thanks for coming! So...here's the deal...to enter to win one of these three prizes, simply leave a comment below telling me which one you like the most! That may or may not have an impact on which one you win if you are chosen, but I'm curious! LOL! Please DO NOT leave 'enter me' or 'pick me' style comments, as those will not be counted. They bug me. Just say'n. K? K. Thanks. You guys rock! Following my blog or Facebook page are not required, but feel free to do so! 'Cause I kinda love it when I meet new friends! YAY!!!! This giveaway is open through Friday 16 December 2011 and is open worldwide. A winner (or two or three) will be chosen and I will post the winner here on my blog, as well as attempting to contact via email. PLEASE LEAVE YOUR EMAIL IN YOUR COMMENT (jinglesells at gmail dot com) so I can contact you if you win! THANKS! Love you all! Happy Giveaway Day! Buh-bye, now! Hi there! 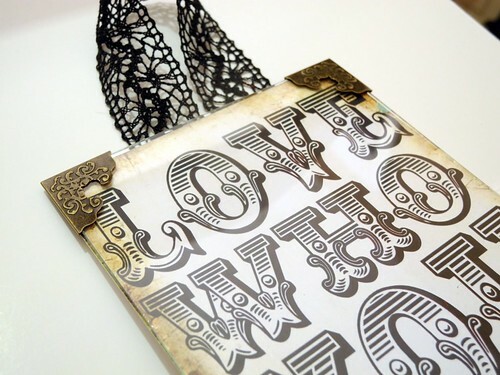 My favourite item is the Love Who You Are Wall Hanging. Thank you! Merry Christmas from a reader from Barcelona, Spain! i love the love who you are wall hanging- too cute! I really like the Fabric Squares from Riley Blake's Samantha Walker Collection, thank you for such a generous giveaway. My favorite is the Love who you are wall hanging. Lovely! the wall hanging is awesome, but i wouldn't be opposed to some fabric charms either ;) thanks for the chance! I would like the fabric squares. I love fabric, so I'd have to pick the squares. But your wall hanging is amazing! In love with the wall hanging....would make the PERFECT gift for my sister. :) The fabric necklaces are also too sweet! Fabric, hands down. I have a slight obsession. I do love the wall hanging & necklace though. Great giveaway! Thanks. I adore the wall hanging! Love the sentiment. Of course, I'd be thrilled to get the fabric too- I'm a quilter and quilters love new fabric :) Thanks for the giveaways! Hello! The wall hanging is amazing, I love that font & the saying of course :) Have a Merry Christmas, and thank you! I love the wall hanging, but they are all great projects! Hard choice! I really like the wall hanging, but since I'm an obsessive fabric-collector, I'd love the fabric squares. I love the wall hanging...and the squares! I know you hate comments like "pick me", so I won't write that...but i'll think it! I LOVE the wall hanging! Also, the necklaces are a close second. I am not good at using my sewing machine yet so that would be #3 for the fabric. My favorite is the "Love Who You Are" wall hanging - I want to give it to my daughter who is a freshman away at college (we're in FL, she's in SD - and she's so homesick). I thought this might cheer her up and give her focus while she's away. All are great, but the fabric is my favorite. Don't tell my daughters I picked that they would choose the others. Fabric squares would be my fave. Thanks for the chance to win some goodies. Thanks for the opportunity to win one of your great giveaways. My fav has to be the wallhanging, it's got a great vibe to it. I would love the fabric. I love making my own projects. i would love the fabric squares to create something special for someone else with. I like the Love who you are wall hanging and the fabric prize offered. What a fun giveaway. Thanks for the opportunity to enter. My fave of your 3 choices is Prize #3. Fabric Squares from Riley Blake's Samantha Walker Collection. I would love the fabric if I won... Been wanting to try making a mug rug all year! Fingers crossed..! I'd love to win the fabric! I'd love to win the fabric. I need some new inspiration. So I shouldn't say pick me, huh? I totally know what you mean by that. Your blog is a new one for me but I like what I see so I'll be back for sure. I think I like the sign the best. The hubs and I are going to be moving soon and I've been thinking a lot about changing up the things in our house so some new art would be a great treat :) Thanks for the chance to win. I would love the fabric squares or the braided necklace! I'm curious to know how the necklace is joined?? I love prize # 3! Thanks for the great give-away! I'd love the Riley Blake's Samantha Walker prize. Riley Blake has some of my favorite fabric lines! I think the fabric would have to win as I am a terrible stasher, but I really love the wallhanging, its got a great message. I would love the wall hanging, but the fabric would be nice too. Thanks for the chance to win! Well, I'm a sucker for fabric more than anything else, so I would love to win the fabric! Thanks for the chance. I LOVE LOVE fabric so I'd choose the Samantha Walker fabric samples. Thank you! and cute blog! Great prizes! I'd love to win some new fabric! Thanks! I would love some fabric squares from Riley Blake! Ooh, I like the wall hanging! I'd like the fabric squares. love the necklaces..awesome!! that's my choice! I am a fabric freak so I love the fabric the most and then of course the fabric necklace! lol they are all very nice and thank you! My favorite is the 'Love Who You Are' wall hanging! i'm a bit of a fabric whore, so the fabric squares would be my pick. Thanks! I would like the fabric the most. :jumps for joy: The Samantha Walker fabric! The colors are just perfect to make place mats for my kitchen. Thank you for the opportunity. Another vote for the wall hanging. :) I love the lettering style, and it's really appropriate for my life right now! Hello from the northcoast of California. I am getting to be more crafty these days, so the fabric squares would be great! Of course, all of the items are lovely! I would LOVE the fabric squares! That's such a great fabric line! My favorite is probably the fabric but I like the other two as well. Wonderful choices in your giveaway! My personal favourite is the wall hanging. It would look great in my sewing room to remind me that I don't have to be perfect! I love all of them but my favorite would be the wall hanging. Any little reminder that it is ok to be yourself and not a perfect person! Fabric! I'm on a self imposed fabric diet, so this would work around that ;) But I also LOVE the top one/sign. That would be so fantastic in my girls' bathroom! I would love to win either the necklace or the fabric! So pretty! I would truly enjoy all three. But, if I have to pick a favorite, I would have to go with the fabric necklace! love me some Riley Blake! I would want the 3rd prize, the fabric. I just bought a new sewing machine and I'm trying to teach myself to sew.. This would be an awesome prize! The fabric! Always the fabric for me:). Great giveaway - thanks! First of all I love your picture...made me smile! I love your wall hanging - although all giveaways are great. I'm a big Riley Blake fan so I would choose the fabric squares. Thanks for a chance to win! I love the wall hanging, so that is my first choice. But my daughter would enjoy the necklace and my step-mom would love the fabric squares! Thanks for the chance to win from such a nice selection! The wall hanging would be a splendid Christmas gift for a loved one! That's what I'd pick! Thanks! I would choose the fabric squares. My 12yo daughter has started sewing, so I will be needing extra fabric to make up for what she uses. Merry Christmas! sorry for all my posting confusion. Hi Creative Girl! I love all of the prizes! My fav is the wall hanging followed by the necklaces. Is it allowed to have two favs? :o) Hope you are having a great week! My email is scrappy_diva (at) yahoo (dot) com. How could I not choose the fabric squares? Thanks! All of your prized are very nice but I seem to be leaning toward the fabric. Thank you for the chance to win. As a slightly random aside, I love that picture of you on your blog - it's just so happy! Love the wall hanging, fabric would be great too. Ooooohhh it's a tie between the wall hanging and the fabric. Thank you for the giveaway. I like the necklaces! I always tell myself I'm going to make some and I never do! 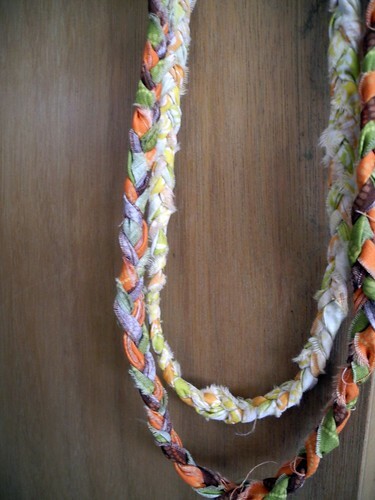 My daughter loves necklaces made with fabric so I would so love to surprise her with this! I would love any of them, but especially the fabric! Thank you for the giveaway! My favorite item is the Love Who You Are Wall Hanging. This is just a great motto to have and it so fits you! You are always so cheerful! Oh Id love to win fabric to make a gift for my Mom, Thank you and Merry Christmas! I think my first choice would be the wall hanging - but the fabric would also be wonderful! I have to pick the fabric anyday. Thanks for the chance to win. I would love the Riley Blake squares. I love the wall hanging, beautiful. Hard to choose--fabric? wall hanging? um, fabric! I love the wallhanging. It caught my eye from the whole page of giveaways on Sew mama Sew. They are all so cute! But I think I'd go for the wallhanging. my almost 7 year old daughter has been having some self esteem issues (at 6 years old!?!) and I'd love to hang this in her room. Wow, all 3 are great prizes, I think if I had to choose it would be fabric as my first choice, then the necklaces, and last the sign. Thanks for the chance to win! Hard to choose! I love the font on the "Love Who You Are" sign, but honestly the fabric squares would probably get more use in my home. I love the wall hanging. I think it's a great sentiment that my 10yr old needs to see. i heart the necklace because i only work with recycled materials!! woot woot! I would have to pick the fabric squares because I am head over heels for all Riley Blake's designs. i love prize number 3! I love fabrics and have such a hard time finding them where we live. Runner up is the "Love" hanging. I would love to win the Fabrics. The wall hanging is great too but I can't get enough fabric at the moment. To many projects not enough cloth. the fabric would be my favorite, but they would all be great! You're sassy- and I like it! All of these are great. I think, however, that the braided necklace is my favorite. I am completely obsessed with braided fabric lately, and showing off a lovely item that someone else created is always a bonus. hmmm hard to choose but I am a fabric addict so please feed my addiction. I love the Wall Hanging! definitely the sign. i have two girls, ages three and almost six months. the room they will share when i'm feeling ready to move the baby into the three-year-old's room (not yet! not yet!) has black furniture and the sign would look PERFECT in there -- and it is the perfect message that i want them to absorb to the fullest. thanks for the chance! I love your "Love who you are" piece as these days I've had some trouble doing that. You're the best, Jingle! I like the fabric the most. Love the feel of fabric! Pretty sure my favorite is the wall hanging, since it's something I tell myself. I like the Riley Blake squares best! But -- let's face it! -- if I won the wall hanging I would SO hang it in my workroom for inspiration! Happy holidays! I'd pick the fabric. You can never have enough, right? Love the fabric, but I have tons, so I'd have to pick the wall hanging! It would go in my craft room! Love the wall hanging!! :) Thanks for the giveaway! Number Three,. I love fabric! I love the fabric squares, I'm a huge Riley Blake fan.. The wall hanging & fabric necklace are also fab. Thanks for such a great giveaway from a very devoted follower. J 'aime vraiment beaucoup votre wall hanging. Merry Christmas to you from FRANCE. While I have never met a good qulaity fabric that I didn't like, I am going to say that wall hanging. I am 42 and still trying to do that! Fabric squares! I love charm blocks! I would really like to win the Fabric Squares from Riley Blake's Samantha Walker Collection. I have a perfect quilt in mind! I am going for the fabric squares. I am a QUILTER , born in Holland and living in France. I really like the fabric squares~Thanks for a chance to win~Merry Christmas!!! Can always use more fabric! Thanks mucho! Thanks for such a generous giveaway. All the prizes are great, but I especially love the thought expressed in the wall hanging! I would love the Samantha Walker fabric! It's such a great line! I would love to have the fabric squares because I have some small projects that I am itching to start. All the prizes are wonderful, though - that for the opportunity! I love love love the necklace!!!! I haven't bought fabric in so long, that would be my first pick to win. Then the wall hanging- very nice sentiment, and then the necklaces, which I would give to my teenage daughter. Thanks for the giveaway! I would most like the fabric since it lets me get crafty. :) I also really like the message on the wallhanging. you know what ? I love all three gifts, even if the surprise of the fabric pack really suits me ! I would love the fabric. Thank you! I would love the fabric squares! I think this is a great giveaway... I think that the fabric is always fun to receive so that my be first but the wall hanging has a great place already in my house..... thanks for a great giveaway!! I'm a bit obsessed with sewing so I would have to say I love the fabric best! I love the fabric necklace...might be the perfect gift for my sister!! Tough choice- I think I would choose #3! I "love" your love who you are - I thought of my 17 yo niece right away! I love that's classic yet edgy, bold yet feminine. Just love love love it. I LOVE the sentiment of "Love who you are" but it's not really on my style, so I'd love the fabric squares! I'd love to win the fabric squares. Now, that being said, I love your gnome at the top of your blog! Gnomes rock! Well hello! I love the wall hanging and the fabric. Thanks for the opportunity to win! Thank you for the lovely giveaway. Your blog is so pretty! :) I would love the fabric squares you can never have too much fabric. I really like the sign, but I can never say no to fabric! Thanks for a chance to win!